Historical Sites in New York are fascinating locations where events took place which changed the course of American history. New York history involves these buildings and places, so if you love historic sites check out this definitive guide. This is a great list of New York historical sites. 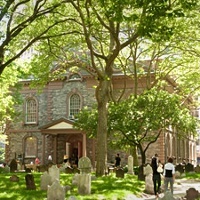 Built in 1764 St. Paul's Chapel is the oldest standing church in Manhattan. When you visit you will step into a building that has survived bombings and fires, and has been a place of worship and respite for presidents and heroes. On his inauguration day in 1789, George Washington attended this church - more than 200 years later it played host to relief workers as a place of shelter and rest after the September 11th attacks. When you visit you can walk amidst the stone monuments in the tiny graveyard in front of the church – many dating back to before America was formed as a nation. This historical sites in NY is open to visitors from 10am - 6pm on weekdays, 10am - 4pm on Saturday, and 7am - 9pm Sunday. From 1892 to 1954 this island was the gateway by which immigrants entered the United States after a difficult, long and often cramped journey from across the ocean. 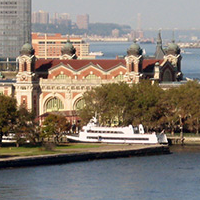 More than 12 million people came through Ellis Island during its operative years and the current Ellis Island Museum tells their fascinating and poingant stories. When you visit the museum you will see artifacts left by immigrants, photographs, videos and prints - you will also hear audio histories from the mouths of immigrants themselves. Walk through the hall where countless people lined up and waited for their turn to find out if they could stay in this new land of hope. Audio tours are available in 9 languages with a special narrated children's audio tour available in 5 languages - making this a great place for the whole family and one of the most interesting historical sites NY has to offer. 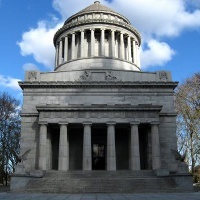 Officially known as the General Grant National Memorial, this historic site in New York is the final resting place of president and general Ulysses S. Grant and his wife Julia. Easily recognizable as the president whose face graces the $50 bill, this famous man was integral in turning the tide of the American the Civil War. The monument erected to his memory requires no admission fee and self guided tours of the memorial are available from 10am to 5pm seven days a week. Stop by the visitors' center for information about the president and memorial. The visitors' center is open daily from 9am to 5pm and free talks about Grant are available at the visitor center at 11:15am, 1:15pm and 3:15pm every day. 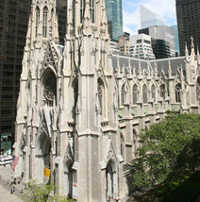 Officially opened in 1879, St. Patrick's Cathedral is a major landmark in New York. With its 330 foot high spires that once towered over the surrounding buildings this place of worship has long been a beacon of hope and peace.The impressive architecture truly makes St. Patrick's Cathedral stand out - taking up an entire city block, it houses windows designed by artists in France, England and America, altars designed by Tiffany & Co. and a sculpted Pieta three times larger than the famous one made by Michelangelo. A National Historic Landmark, this cathedral has been host to a huge number of illustrious guests and has been a setting in many famous novels and movies. Free tours are available upon reservation, or visitors can go to worship, pray or simply wander through the famous cathedral. There is no admission fee to enter the cathedral and visitors are always welcome to attend scheduled masses. One of the Finest NY Historical Sites! Built in the late 1800s, this Romanesque Revival structure is an impressive building which stands out against the Albany landscape. 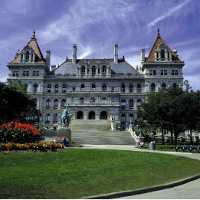 Home to the New York State Legislature, this white granite building has many fascinating architectural features. Vaulted ceilings, sweeping carved staircases and exquisite stonework fill the building's many rooms. Be sure to visit the Red Room to see the elegant decorating and architecture, the mahogany wainscoting and bronze leaf that make this room truly beautiful. The Flag Room is home to almost 1,000 battle flags from the War of 1812 through the Gulf War and is a memorial to all who lost their lives in these wars. Free guided tours of the capitol building are available Monday through Friday. Integral in the defense of New York against the British invasion from Canada in 1777, Fort Stanwix's defense helped bring about the victory at Saratoga which were a turning point in the Revolutionary War. Located in between historical Oneida and Mohawk indian territory this fort was destroyed by heavy rains and fire in 1781. 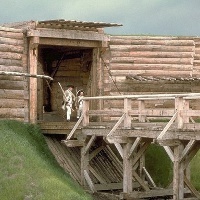 The current fort is a reconstruction on the site of the old fort and is home to many artifacts and collections that tell the story of Fort Stanwix and the history of the land and indian tribes surrounding it. Admission is free to this U.S. National Monument and Fort Stanwix is open year round from 9am to 5pm except on select holidays. Visit to see nearly half a million artifacts, documents and exhibits about the fort. You can tour the fort alone or join a ranger-led tour to hear interesting facts and history. This 150 year old cemetery is the final resting place of over 300,000 individuals. It is home to great individuals remembered through the passing of the ages, and others who are remembered only by their name carved in stone. Woodlawn is host to such famous artists, writers, leaders and philanthropists as Irving Berlin, Duke Elligton, Joseph Pulitzer, Herman Melville, Fiorelo LaGuardia and Augustus Julliard. A National Historic Landmark and garden cemetery, this place of rest is filled with beautiful monuments, rolling hills, flowering trees and impressive sculptures. 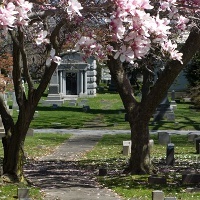 Visitors can take guided tours of the cemetery or wander on their own for a look at the resting places of famous individuals or simply to appreciate the natural beauty. The grounds are open for visitors seven days a week from 8:30am to 5:00pm. Visit the onetime home of world famous author Edgar Allan Poe. The cottage in which Poe composed some of his most famous poems and where he spent the final years of his life is located right in the Bronx. Having been restored as a museum, the cottage is now decorated in authentic period style with several of the original furnishings of the Poe family. 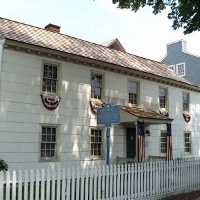 Visitors can watch a film presentation on Poe and his tragic life and death, and can have a guided tour of the small cottage where, among other things, they will see the bed in which his beloved wife Virginia spent her last moments. 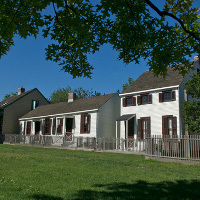 The Poe Cottage is open on Saturdays and Sundays - admission is $5 per adult. This house once belonged to famous artist and leader of the abstract expressionist movement Jackson Pollock and his wife, artist Lee Krasner. This house was used by both as a home and studio, as was the barn that stands nearby. Now a National Historic Landmark, this is one of the most artistically significant historical sites in NY. The house and studio have been turned into a museum memorializing the artists and their work. The rooms of the house are furnished with items that belonged to the artists including their personal library and record collection. 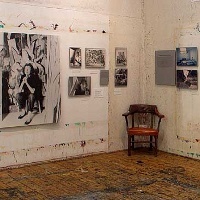 Visitors can see the barn studio in which Pollock painted many of his most famous paintings where drops of paint still remain on the floor and ceiling from his work. The house and museum are open for general admission June through August on Thursdays Fridays and Saturdays, and in September, October and May by appointment. 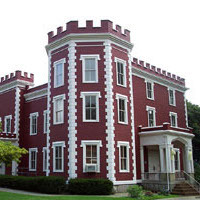 If you are looking for some of the most interesting historic sites New York has to offer, then be sure to visit Raynham Hall. Built in the early 1700s, this house was the home of Samuel Townsend, a wealthy merchant. During the American Revolution Townsend turned spy while his home was used for 6 months as headquarters for British General John Simcoe. Now a museum, this house is decorated and furnished with over 5000 authentic artifacts from the late 17 to 1800s. Learn about life during the times of Samuel Townsend and the Revolutionary War, see the type of clothes the Townsend family would have worn and the furnishings and decorations they would have had around their home. Smaller exhibitions change regularly and highlight specific aspects of colonial life or individuals. The museum is open Tuesday through Sunday from 1 to 5pm. Admission is $5 per adult. Visitors to Historic Richmond Town can tour the 100 acre area in which can be found over 30 original historic homes, commercial buildings and civic buildings. One of the oldest homes in all of the US is located here and is almost 350 years old. Learn about the lives of the former inhabitants of this village as you walk through houses filled with period furnishings, decorations and belongings. Join a guided tour and have a guide in period dress bring you from building to building and explain about each exhibit. 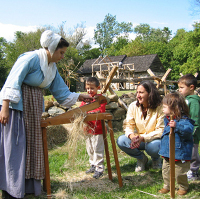 Tours are themed by day, so check ahead to see whether you'll be learning about early American government, life before electricity, early American cooking, or other exciting tour themes. Admission is $8 per adult visitor and the town is open year round from Wednesday through Sunday. 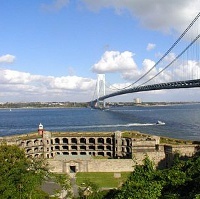 One of the oldest military sites in the US, Fort Wadsworth was built in the early 1800s to defend the Narrows - the entrance to New York Harbor. When you visit you can explore the mazelike tunnels and rooms of the fort and imagine what it was like to be a soldier there in the 1800s. Be sure to get a guided tour of Battery Weed, a fortification which sits right on the harbor and was built in 1845. Stop by the visitors' center and see interactive exhibits about the fort's history, or take a tour of an officer's home decorated as it would have been when he still lived there. This historic site in New York is not only a historic location but also a great vantage point from which to view New York Harbor and New York City. The fort and park are open dawn til dusk - the visitors' center is open Wednesday through Sunday 10am to 4:30pm. This historic church was built in 1886 and, with a steeple of 212 feet, towers above the surrounding area as a beautiful example of Neo-Gothic architecture. Seating over 1000 people, this huge place of worship is decorated inside with intricate stenciling, carvings and gorgeous stained glass windows. The windows, designed by various artists are made in a range of styles and each one is filled with meaning and Biblical references. Currently undergoing restoration to its main building and stained glass windows, this church remains open. 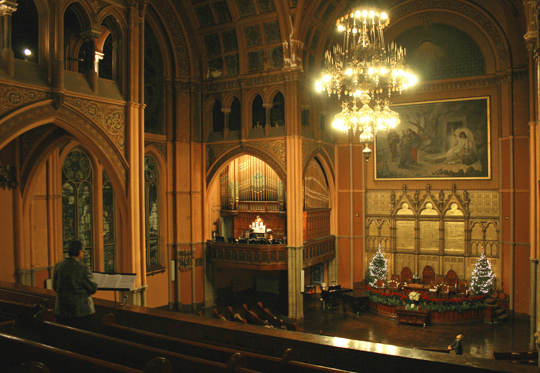 Events are held regularly at this historic church in NY and visitors can attend Sunday services. 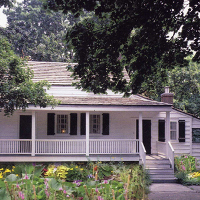 Visitors to this neighborhood will see the Hunterfly Road Houses in Weeksville; listed in the National Historic Register, these preserved homes belonged to free African Americans in post-civil war America. The village is named after James Weeks, a freed African American slave, who bought the land shortly after slavery was abolished. Soon a vibrant village with schools, churches, newspapers and more sprang up in the area, populated by free African Americans of all occupations. Now, only three of the original houses remain in this once bustling village in Brooklyn. The heritage center has been established to ensure the protection of these landmarks. Tours of the restored houses are available where visitors can learn about the village and the history of free African Americans in New York. Cultural and community events take place regularly at this site as well as educational workshops. Military Base, Nature Trails and Beautiful Beaches! Spend an afternoon exploring the abandoned military buildings of Fort Tilden. Established in 1917 as a defense point for New York Harbor, this military installation was decommissioned in the 1970s and has since fallen into the overgrown disrepair of many of the former military sites that line the harbor entrance. Several parts of the fort are listed in the National Register of Historic places - history buffs won't want to miss checking out the huge cement casements of the 16" bore, one of the largest cannons of its time. A fascinating place to visit, the fort area is surrounded by natural wildlife areas and beaches. Take a Tour of "the Castle"
Thought to have had its plans designed by General Robert E. Lee before the Civil War, the building was erected in the 1870s after the war. Located within Fort Totten Park, this historic building, sometimes known as "the Castle" served as an officers' club until the 1970s. An excellent example of Gothic Revival architecture, this building has survived the years in excellent condition. Now headquarters for the Bayside Historical Society and listed on the State and National Registers of Historic Places, this building is home to the society's exhibits and archival collections. Exhibits are changed regularly and highlight different aspects of the area's culture and history. Visitors are welcome Thursdays, Fridays and Sundays for a small suggested donation of $3 per person.